Yesterday I gave my 4th, 5th and 6th grade students "free day" which means they get to make what they want. It is their favorite thing. They have plenty of ideas of their own, and love to saw wood, use nails and glue and put things back together in new configurations from their own imaginations. Free day for me is rather chaotic, with my name being called out constantly. "Mr. Doug," they say, "can you help me with this?" Or, "Mr. Doug, do you have a piece of wood, this big?" The work that results is not of the finest sort that will be kept in museums, but is taken home with great pride. Our student work serves as evidence of creativity and engagement. These are real problem solving exercises of their own making, and while research reveals a marked decline in creativity among children as they age past kindergarten, creativity and creative engagement are intellectual components that require nourishment in a healthy society. I have been finishing boxes as shown. After putting linings in these, I'll turn my attention to finishing some tiny bentwood boxes I hope to sell. Make, fix, create, and insist that others learn lifewise. Yesterday in the wood shop I added lift tabs to lids of boxes, did the final sanding, and applied Danish oil. One more coat of finish will be required, and adding linings will finish them for sale. For a squirrel, the acorn is just a nut. For a human being it takes on greater meaning, and may symbolize the potential of renewed life. The hands are not only instruments of our creativity, they are symbols of engagement and symbols as well of our higher selves. When the first mate calls for all hands on deck, he's not asking for the disinterested to saunter up from the hold. He is asking for the full intellect and strength of humanity to rise in full measure to the circumstances at hand. And so when I say that the hands are essential to learning, I am referring to both the physical hand and symbolic hand. If you think back to any learning experience that left a deep mark on your framework of understanding you will discover that you were fully engaged at the time, in reality, doing something that required the presence of whole being... that which the hands are the most effective and accurate symbol of. To put the hands at the center of learning and of schooling is to recognize the full potential of the human soul. We are given these instruments to be of service to each other, and even the very young and very old have need of being useful to their families and communities. In the "Lovely County Citizen" this week, Dan Krotz wrote about recent research indicating that children are taking longer to develop into adults. "Today's 18-year-olds look like 15-year-olds once did." Dan points out that this might be a good thing, in that teens are no longer sent to the mines. On the other hand, it may be that a steady diet of digital distraction immersing them in fantasy, and a lack of doing real things in school are making them reluctant to engage confidently in real life. Where we are going with all this may not look so good. Better would be that we simply accept that the hands must be at the center of learning. They have the power to engage us all in learning at greater depth, and to greater lasting effect. Thursday is a home shop day for me, in which I'll finish some boxes started as demonstrations during summer classes. We also have Studio Stroll at ESSA, 4 PM, and then Thursday night professional football on TV. I almost never watch football, but feel inclined to do so, simply to express solidarity with those who kneel. I find it ironic that kneeling, which has always been a sign of reverence, deference and respect has become for Trump and his minions a sign of disobedience, defiance and disrespect. What a shameful parallel universe of distortion and lies they are attempting to impose on us! There is a simple honesty in craftsmanship (and also in athletics). If the joint is badly or carelessly cut, it shows. If a pass is thrown poorly, it misses its mark. In the real world there is no place to hide from one's failure. Practicing craftsmanship (on the field or in the wood shop), we learn from our real mistakes and try to do better. It's not exactly like that in politics, where folks in power are allowed to pretend whatever they want. For examples, global warming is a hoax, and if you put enough money in the hands of the rich, it will trickle down in time so that all prosper. I'm curious whether those who have imposed such stupid notions upon the unwary, ill-educated and uninformed will ever fess up and at least say, "oops." Perhaps all would benefit from the practice of craftsmanship of some sort. The photo shows boxes made during summer classes as demonstrations of technique. Finally, with hinges, and sanding they can be sold or given to charitable causes. My tool chest that I made to test the Woodhaven Portable box joint jig is in this month's Fine Woodworking along with my product review. Sample copies of the magazine came in yesterday's mail. If you are a subscriber look at p. 22. Today in the Clear Spring School shop, my middle school students will work on boxes that they can then decorate with pictures cut or torn from magazines. The boxes will be a statement of personal interest, but also be something they can use for years to come, keeping special things inside. A box can be an explanation of personality and self. There are things that are evident on the outside of the box, and yet within, are things that make each of us unique. My first, second and third grade students will work on making "super heros and cats." Yesterday my high school students continued exercise in framing square math and I learned through it that some were having trouble with fractions. One said, "I learned fractions in 4th grade, but haven't used them since." But being unable to measure accurately is a handicap. We gain ease in using and understanding fractions by using them, and using them again and again. Following Joe Youcha's book, "Framing Square Math," I cut a series of pine blocks of varying dimensions, and stamped them with letters so they could be identified and reused. The exercise requires each student to choose two, and then to use a framing square to measure them, length, width and height. I assured my students that it was an exercise, and not a test. The test comes when they are required to make something that works, and that fits. But they each wanted me to double check their work to see that they got it right. Today I will be installing hinges in boxes prior to sanding and finish. Today at the Clear Spring School, my high school students will practice measuring using framing squares, following exercises described in Joe Youcha's book, Framing Square Math. In preparation for these exercises, I've prepared random sized blocks from pine. I will mark them with letters so each can be identified. The students will determine the dimensions, length, breadth and height. The point, of course, is that we (including our children) learn best by doing real things. The principle in Educational Sloyd was described as moving from the concrete to the abstract. When education is set up to move the other way, as it most often is, students are left disengaged, and bored. Failure to engage student interest makes what American schools spend on education a colossal waste. My 4th, 5th and 6th grade students will finish their models of the solar system, and turn pens on the lathe. My first, second and third grade students will continue making toys for their pleasure, learning and amusement. Routing the boxes shown and cutting the lids free will wait until much later in the day. Yesterday I applied Danish oil to veneered boxes, and I'm pleased with how they've turned out. So I began working on 9 more. These will be sold or given as gifts. The veneering is done as a form of play, and the process leads to three or more top panels made at the same time. Even though they are done at the same time, the process insures that each is unique. The point of course is that there's pleasure in the making of each one, and someone might find some pleasure in keeping special things inside a finished box. I am interested in learning whether the maker movement and the excitement that some participants find in it will lead to the long term development of quality craftsmanship. As an example, a friend of mine, Larry Williams, has been making wood bodied planes for many years. His are the state of the art, and prized by collectors. He has only recently, and after so many years discovered design details in early planes that he and his partner will apply. The point is that watching a few youtube videos and doing what you see on screen is not enough to fully develop as a craftsman. Craftsmanship often requires years of doing the same thing over and over and applying steady attention to the improvement of your craft. It takes some level of dedication and commitment. Will the resurgence of interest associated with the maker movement lead to quality craftsmanship? It may take 40 years to find out. quiet day in the wood shop. Today in Northwest Arkansas we will navigate through an event called "Bikes, Blues and Barbecue" in which motorcycles and their riders will swarm on the highways and drink at taverns, and cluster in mass quantities to do so. Over 350,000 bikes and riders are expected, and my small town of Eureka Springs is one of the prime destinations. The roads leading to and from town have hills and curves that make riding a thrill. One of our local pubs has a refrigerator semi-trailer parked outside to hold their inventory of beer. It will likely be emptied before the weekend is over, and we are hoping for a safe ride for all. In the meantime, I have shop work to do. If Bike, Blues and Barbecue is like those in the past, there will be a steady drone of revving cycle engines, interrupted by sirens as the police and ambulances respond to difficulties. Again, my fingers are crossed for a safe ride by all. I'm planning to finish boxes, start some small bentwood boxes, and will attempt to clean shop. Yesterday some of my 4th, 5th and 6th grade students finished their models of the solar system. Some students were in a hurry to take their models home, but some will be left on display in their classroom as examples of student work. Yesterday we had the premier showing of Eleanor Lux's Arkansas Living Treasures film showing her at work in her beautiful studio and talking about her work. There were about 50 people attending and enjoying the three films about local "treasures." We had the films showing in both the bench room and lathe room using the TV's we use for student instruction. In remarks, I attempted to direct attendees to the necessity of making in schools. If students aren't making beautiful and useful things, let them at the least make music. If they are not making music, at the very, very least let them make spaghetti. Schooling should be infused with real life. If you want students bored, disinterested, disengaged or disruptive, proceed just as we have with a regimen of isolated academic endeavor, thus keeping our children safely sequestered from the wonders of real life. The photo shows a very simple way to provide an essential tool for elementary school wood working, a sanding block. In Educational Sloyd, sanding was discouraged, as it was preferred that all shaping of wood be done with very precise, individual mindful cuts. Sanding obscurred those cuts. That level of craftsmanship would be lovely today, too, but children and adults rarely have patience for that level of infusion of mind and hand. The sanding block can be used to shape edges and make smooth, leading the student to observe with some greater care. To make sanding blocks I use self-adhesive sand paper, cut with scissors as shown and folded around the edges of a piece of wood. These can be held in hand or secured in the vise. Today we have a mini documentary film fest at ESSA with three short documentary films will be shown featuring the three Arkansas Living Treasures from Eureka Springs. They say that hanging out with prize winners may lead to a greater probability of receiving the same award. Larry Williams, ALT of 2006, Eleanor Lux, ALT of 2016, and I have been friends for about 40 years. Yesterday in the wood shop at Clear Spring School, I went over a few concepts with my students. Straight and square are useful math concepts that are essential to wood working, but will also be useful for other things. The mini documentary film fest at ESSA begins at 6 PM immediately following Studio Stroll in which guests are invited to see what students have made during the week. You are invited. There will be a short Q and A following the films. The cat in the photo is first rate, first grade work. The sensitivity of the child. Children will spend a lot of time pretending through play, but this does not mean that they are insensitive to the implications of real life, or that they are incapable of discerning that which is real from that which parents and teachers have contrived for their distraction. For that reason, schooling should not be arranged to sequester children from reality, but to engage them safely in it. Perhaps that's why students at the Clear Spring School enjoy wood shop so much. They are enabled to use real tools and real wood to make things drawn from their own imaginations. "Just teach the parent/child class like any class. The parents will take the lead with the machines but the kids can do all the creative stuff." I suspected that might be the case. It seems that the world is coming apart, with hurricanes, earthquakes and general stupidity at the top. There are some things we can fix, and some things not. But to take wood in hand and make something useful, beautiful or both allows one to feel for a few moments at least, that there we have some power and some control, in our own lives at the very least. As we build the future one small gift of useful beauty at a time, things may add up. The boxes shown in the photo are now ready for hinges, a lift tab, finish, then sale. At Clear Spring School today I will introduce first graders to the use of hand planes. It has 6 legs (or four arms and two legs) along with cat ears, and wings behind. What is it? Even the child who made it is not sure. Yesterday my first, second and third grade students continued making "superheroes. "Some of my fourth, fifth and sixth grade students would have preferred that activity to making models of the solar system. But we started that project anyway. We must make certain that children's brains are effectively engaged in in school. In the early days of manual arts training, administrators were concerned that exercises not be "purely mechanical," meaning that what the children did and made must involve the brain as well as the hands. Children's hands were not to be put to mindless (and mind numbing) tasks, like those one might find in industrial employment. Now we must demand that educational activities involve the hands as well as the brain. The hands and brain form a learning system in which each part refreshes and sustains the other. Make, fix, create, and make full use of our most effective learning instruments: our hands. I have disks cut out to represent the sun, and large and small dowels to cut into discs representing the various planets, proportional to their real size. The students will drill holes mounting their planets, and will paint their work in their classroom or art class. This will likely be a two day project, finishing later in the week. The difference between these boxes and the veneered boxes I've made in the past is very subtle. The veneered top panel is recessed slightly below the sides, allowing it to be glued in a groove and for all the edges to be buried. That makes fitting easier and less prone to error, as the panel needs not be cut quite as precise. Some may see the recessed panel as an interesting design feature (or not). Slightly less time will be required per box. Other features will be the same as in some of the boxes I've made in the past. I'll install keys at the mitered corners to strengthen the joints, and use spring loaded barbed hinges to connect the lid to the base. The veneered top panels are some that I did as demonstrations and I'm attempting to make use of unfinished works. We have witnessed a radical depersonalizing and unraveling of the fabric of human society. This is taking place in small communities, and in the world at large as people display greater anger and intolerance toward each other. If we were living in an earlier time, I might be wearing the socks and mittens you made from the wool of your own sheep. You might be eating the wheat I raised and paid in exchange. We would think kindly of each other and be kind to each other. The web of human existence and the fabric of community life were carefully crafted from small repetitive acts of kindness and concern. The exercise of craftsmanship and the exchange of useful beauty is the antidote for a society in decline as ours seems to be. A recent study proclaimed Minnesota as the happiest state based on a number of interrelated factors. My state of Arkansas was 46th as one of the very least happy. I will be teaching in Minnesota on the 10th, 11th and 12th of November so will have a chance to see that happy state first hand. On Thursday at 6 PM at the Eureka Springs School of the Arts, a new documentary short film about 2016 Arkansas Living Treasure, Eleanor Lux will be shown in public for the first time. Larry Williams, Arkansas Living Treasure 2006 and I, Arkansas Living Treasure 2009 will also be on hand to talk about our work, as our documentary films will also be shown. You are invited to attend. Make, fix, create. Make yours a happy state. I have many small projects that require attention to complete. The object of completion is to get them out of my way and placed and sold (hopefully) to make room for further production. In Sweden in the 19th century, German manufactured goods overwhelmed the populace. In the past the Swedish farm families had met most of their own needs for boots and gloves and you name it, by either making these things or trading with neighbors. In the crafting of objects, the crafting of the intelligence and character of the people was assured. When the cheaper, but well manufactured German trade goods decimated the value of home craft, the Swedish farmer turned to the making of Branvin as a source of revenue to replace that lost when their home crafted goods were no longer of value. Drunkenness was a by-product of the exchange. The Lutheran church became deeply concerned, as did the Swedish Parliament and King, just as we should have been over the past 150 years. Educational Sloyd, the use of woodworking as an important part of school, was the means through which the industriousness and intelligence of the people was to be restored and the whole of Swedish culture was to be put back on the right track. We can do the same thing here. It is relatively simple. Give students the opportunity to create. The use of the hands refreshes and energizes intellectual capacity. Don't believe me? Try making something. In wood shop at the Clear Spring School yesterday, as some students were finishing their pen sets and whittling pens, I invited others to make "super-heroes." One first grade girl announced, "I want to make a cat." Another one suggested, "It could be cat woman!" And so they began making super hero cats as shown in the photo. They used the little scraps that resulted from forming the neck to make ears. The photo also shows one left unfinished, and another with moveable arms. Perhaps you can understand why children love wood shop. What they learn will not be effectively measured in standardized testing, but in real life instead. The children asked, "May I take this home?" And of course they can, and they did. To make a super hero (or cat) of your own, begin with a piece of 3/4 in. white pine 2 in. wide by 6 in. long. Use a band saw or straight cutting hand saw to begin forming the legs. Then have the child make a coping saw cut to remove the scrap of wood from between the legs. A coping saw is used to make cuts forming the neck. The top of the head can be sawn to shape or left flat for the attachment of ears, which are glued in place. The super hero stock must be mounted securely in the vise for all cuts. We use a drill press to drill holes for the arms to fit. In drilling, I hold the stock securely in place as the student turns on the drill and turns the handle to form the holes on either side. 1/4 in. dowels are glued in place to form the arms. Today I will ship boxes to the Historic Arkansas Museum in Little Rock. Make, fix, create, and help others learn lifewise. There is a national debate about the effectiveness of a longer school day. If it makes room for recess it might not be such a bad idea. But educators might want to look more seriously at Finland. In the international PISA testing, the students of Finland have regularly thrashed American students, and they have far more recess time and less time in school than do the students in the US. "...play constitutes a significant part of individual growth and learning in Finnish schools. Every class must be followed by a 15-minute recess break so children can spend time outside on their own activities. Schooldays are also shorter in Finland than in the United States, and primary schools keep the homework load to a minimum so students have time for their own hobbies and friends when school is over." Perhaps instead of lengthening the school day, we should look at a more comprehensive approach. We know that the things we've each learned that had maximum and lasting impact on our understanding were those things we learned hands-on. Can we not use that idea to reinvigorate all schooling? Yesterday at Clear Spring School, the 4th, 5th and 6th grade students formed a solar system on the school playground. Even serious schooling can take the form of play. Each student was assigned the role of a planet. And when they were organized began to orbit. Today at Clear Spring School, my first, second and third grade students will whittle pens and begin making boxes. Mondays are my busiest days at the Clear Spring School. I have middle school and high school students in the morning and then all of the elementary school kids in the afternoon. That along with materials preparation makes for a busy day. David Pye, a woodworker, philosopher and author in the UK, had noted that writing with a pen was an example of the relationship between certainty and risk. You cannot dip a pen in ink without it leading to a mark. You cannot erase what you have written in ink, and so once you set the tip of the pen to paper, things are changed. Pye recognized two forms of workmanship, that of certainty in which the intelligence is built into a particular device and the results are consistently the same, and that of risk in which total attention of the craftsman is required. In workmanship of risk, one slip of the chisel and you are set off in a quest for for plan B.
Workmanship of certainty may be performed by the unskilled and unthoughtful. Workmanship of risk is made successful through the exercise and development of skill and mindfulness... Developing therefore the character and intelligence of the craftsman. In workmanship of certainty the jig is made and the results of the machine like operation will go on and on in relative perfection, until the machine like operator shuts down the process. In workmanship of risk, whether writing with a pen, or sawing dovetails by hand, there are opportunities for growth of either skill or intellect available to the craftsman. "Pye proposed that we build things to effect change." Workmanship of certainty may have a profound (and overwhelming) effect on the world around us. Workmanship of risk is a means through which to transform self. Today I will sand boxes, sign them and apply finish. Yesterday in the wood shop I inlaid and assembled another dozen boxes. If a box or two of a particular design are necessary to complete an order, I make several extra at the same time to be assured I have boxes in my inventory to sell later. My strategy developed as a custom furniture maker. Living in a small town in Arkansas, when there was not furniture piece to demand my attention and skill, I made boxes in preference to spending a day idle. I also sharpened Sloyd knives, and prepared stock for whittling pens. Today all my students will be in the wood shop at various times, from high school through first grade. All will be given sticks of wood to either carve or turn on the lathe. I also found that we can buy Chinese made ink pens on eBay for our students to use when they tire of dipping their own crafted pens in ink. In the photo, some boxes have received their first sanding. Others have not. Make, fix, and create. By doing so, you may encourage others to avoid the ineptitude that can come from failing to learn likewise. reaching back toward lost individuality. An editorial from the Washington Post, https://www.washingtonpost.com/outlook/how-silicon-valley-is-erasing-your-individuality/2017/09/08/a100010a-937c-11e7-aace-04b862b2b3f3_story.html asks fascinating questions about loss of individuality as we each become more enamored with what is offered online, and we do less to express our own personal circumstances and individual creativity. before the milk runs out. Yesterday in the wood shop, I made a stack of wooden boxes as shown. While they all fit a basic construction formula, each is different in subtle ways. In schools, when it comes to cursive, each child develops his or her own style. That is not the case when it comes to data, shaped to conform to exacting standards through tapping on keyboards. The point is not that cursive as an exercise is precious, but that the individuality of each and every individual is. It has become clear that the online world presents a serious threat to our humanity. Engagement in the arts is a means through which we might escape what ails us. The promise that proponents of high tech make is that it will make things so easy. The satisfaction that is to be found in human life is dependent on doing difficult and demanding things. Are we to "float" through each day, or are we to grasp pen (or some other real tool) in hand and begin to make a real difference in our own lives and the lives of those around us? Yesterday during recess at the Clear Spring School, I took note cards and pens and ink out to the picnic table where teachers were gathered, so they could experiment with the writing pens we make. It should be noted that recess is not only important to kids, but also to teachers. It is a time to share concerns with each other and to share what is going on in their classes, while the kids come and go and release pent up energy from class room sequestration. It doesn't hurt that the Clear Spring School campus is lovely. The teachers were excited about making pens of their own and practiced with the note cards, pens and ink. The simple pen holder consists of a piece of wood with two holes drilled in it, and then decorated and personalized with letter stamps and markers. One large hole is to hold a bottle cap in which ink can be dipped, and the other is sized slightly larger than required to fit the nib so that the pen can stand up at the ready when not in use. We are using bottle caps as ink wells. Those who have not written (recently or ever) with real dip in ink pens may be surprised by the thoughtfulness required. The pen holds just a enough ink for a word or two before dipping again. Practice is required as to the flow of thoughts onto paper, and slowing down and becoming more thoughtful in what we express is not a bad thing. The photo shows 4th, 5th and 6th grade students with their carved pens and pen sets. They voted on whether they wanted blue or black ink to take back to their classroom. Do you suspect that writing is more fun when you are using dip in ink pens that you've made yourself? This is an example of what is meant by integrating arts (and particularly wood shop) into the curriculum. Today in my own wood shop I'll be making boxes. Make, fix, create, and take the fundamentals of real life into your own hands. Yesterday the director of ESSA and I met with folks from the North Arkansas Community College about possible collaboration, finding ways to serve their students, and maximize the use of our facility. It may become a useful partnership for both institutions. I've begun working on more boxes. In attempting to fill an order, I discovered that some sizes and types were in short supply. Must make more boxes! Lids must be inlaid and various parts made before the boxes can be assembled and sanded. It's a very good thing, as the making and selling of boxes in a stream of work keeps money flowing into the operation, allowing me to buy more materials and to pay for expenses. Today I meet by teleconference with a panel of judges to choose the recipients of various Arkansas Governor's Awards in the arts. I've been somewhat overwhelmed by the number of nominees whose entries must be read through carefully. The jumble of clamps and pieces of wood are pencil cups being glued up before being inlaid. I work until all the wooden pads and c-clamps are in use, and then do other things while the glue sets. 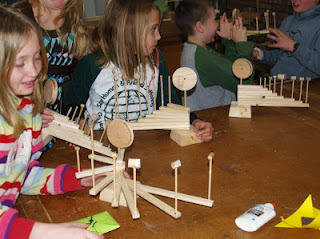 Yesterday was our first day of wood shop for my first, second and third grade students. In the meantime, I have a thick notebook to review for the Arkansas Arts Council as I was selected to review nominations for this year's Governor's Awards in the Arts. There are about 62 different applications. Some are very well documented and some are not. Some of the categories are more difficult for nominators and perhaps reviewers to understand. For instance, the Arts in Education Award calls for "An individual or organization that has made an outstanding contribution to integrating the arts into the educational curriculum." The challenging word in that is "integrating." Does integrating mean that you have the arts as part of your curriculum but where you do the arts in an unconnected manner? Or does integrating mean purposeful arts integration. Tomorrow when I meet with the other reviewers in a conference call, I will ask what the Arts Council means by "integrating the arts into the educational curriculum," just to make sure we all are on the same page. My first day of school could serve as an example of what I have in mind. We have recognized the necessity of teaching children to read and write cursive. So lesson one was to make a desk set for hand made fountain pens. Each involved sawing. Each involved drilling holes where the pen would rest and another where an inkwell could be placed. Each involved the use of steel letter stamps to put the child's name in place. Next week the desk sets will be further sanded, decorated with markers (if the children want) and we will begin carving real ink pens. When the projects are complete, they will be taken to their classroom and used in learning to write. Integrating in my mind is not to have art as a separate activity, but to have the arts infused throughout the learning process. Is history brought to life through art? Is literature? Is math? And if you answer yes, then you know what I have in mind. The thing that makes arts integration possible is collaboration between members of staff, and the recognition that there are truly no walls between the arts and the rest of the curriculum but those established and fiercely defended by narrow minds. At the Clear Spring School and in those schools that have been fully trained in A+ all make a commitment to infuse learning in all subject areas with the arts. With 10 tiny students in the wood shop yesterday, I had no time to take photos until the students were gone and the mess we had made had been cleaned up. The photo shows their labors. Yesterday, Barry Dima from Fine Woodworking and I did more photography to illustrate making a hidden spline joint. We shot the sequence on speculation that perhaps the magazine will be interested in an interesting technique useful to box makers but less common than a fingerjoint or keyed miter joint. The technique for this joint is one that I discovered on my own, so it's not one that I've found published in other books or articles but my own. For that reason it may be of lesser interest. The things we do in real life have greater importance to the shaping of our intellect and character than the things we read or witness second hand. Is this a difficult concept to comprehend? Is that not an idea (and ideal) that should be applied in American education? The other thing about being involved in real life in comparison to commonplace American schooling is that one learns how things work, and how to recognize when things do not. Let's take the multiple choice question as an example for exploration. Whether in a teacher contrived test or one made by the standardized testing industry there will be one right answer and 3 or 4 that are made up and recognizably false, particularly to those who have a foundation of personal experience. I'm using Duolingo to study Swedish and Norwegian and recently, Duolingo pronounced me 23 percent fluent in Swedish. The truth is that I simply know how to discern a wrong answer when I find one. So I am not actually that fluent. I simply know how to read through a set of answers and know when they are off the mark. Yes, I am gradually getting better and building my vocabulary, but I would be hesitant to claim even the lowest level of real fluency at this point. The only reasonable and real test would be to converse with a Swede. All else is bull hockey. Is it fair to say the same about schooling when it ignores the real learning and developmental needs that children have? Since I've packaged and shipped the box shown above for the article in Fine Woodworking, I guess its fate is sealed. I appreciate those who offered advice as to whether or not to put a pull on it. I chose the lazy and least intrusive solution by leaving it without pull. My book Making Classic Toys that Teach has not as yet taken off in sales. It is a book that's hard to classify. Is it a book about making things, or is it about the history of progressive education? It is both, and it is intended to set the stage for families that are healthier and better engaged in giving to their kids, what they really need to thrive both in character and intelligence. If you are not familiar with this book, it can be found on Amazon.com here: https://www.amazon.com/Making-Classic-Teach-Step-Step/dp/1940611334 You can help the book to have a larger impact by suggesting it to family and friends. Make, fix, create and insist that children be given at least a chance to learn likewise. Yesterday in front of a Fine Woodworking camera, I posed for hundreds of shots that will be used to illustrate an article on cutting "box joints." 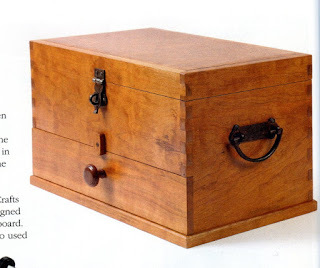 There are several kinds of box joints, but the term "box joints," is often used to describe what are also called "finger-joints," cut with a box joint jig, either on the table saw or router table. We got the photography on that article done with so much time to spare, that I've asked that they consider another article as well. Today with no promises of publication, we are going to make hidden spine joints... another form of box joint. Sound a bit confusing? A few photos provided later will suffice. Make, fix, create, and assist others in learning the value of learning likewise. I learned yesterday that the public middle school here in Eureka Springs allows only 45 minutes per week of recess time. That recess time is also used as a form of punishment by being withheld from those students who misbehave or fail to do their work. It is extremely frustrating here in my own town to see such negligence as to the real needs that children have. I've had friends who have tried to make a difference by becoming members of the public school board, but when they've done so, have found that their input and concerns are not allowed for. Frustration reigns supreme. And why is recess important to kids? Play is not just play. At the Clear Spring School, denial of recess is not the case. Our children and staff need it and revel in it. Just as students need time to unwind, teachers, do too. And I have to marvel at the stupidity of modern schooling. In Finland, for example, students have more recess time than any other nation in Europe and beat the pants off Americans in the PISA testing. I have made a decision to leave the lid of the box unadorned. I can still choose a pull at a later time, but have agreed with many of my readers that the lovely piece of walnut may be best left alone and seen without obstruction. Today I will work with an editor from Fine Woodworking on an article about making box joints, like those seen in the box (with no pull) in the photo. This box also suggests a lesson on the mixing and matching of woods. How can one decide what kinds of wood look good together? I invite my readers to tell why these woods fit with each other, or if not why. Make, fix, create and insist upon the value of play in schooling. I am almost ready for the arrival of an editor from Fine Woodworking to take photos for an article about cutting box joints. The photo shows a sample box that will be used as a prop, serving as a stand in for one made under the watchful camera gaze. 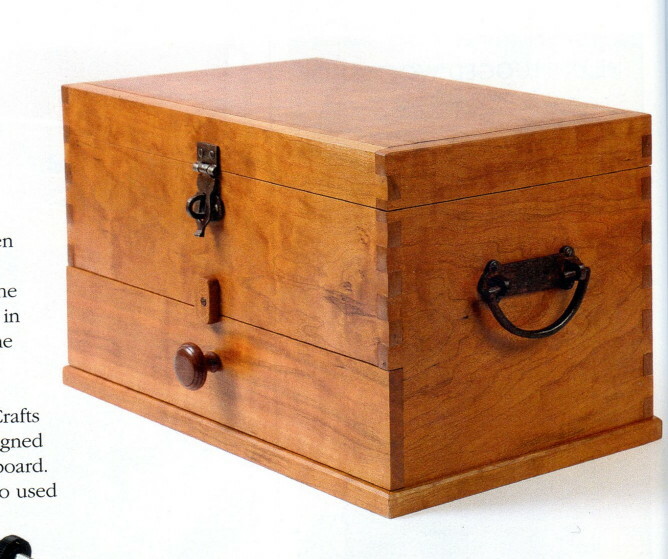 The box is made from cherry with a figured walnut lift off lid. My dilemma is this: Do I put a pull on it or not? The lid is large enough that a pull would be handy, but the wood is figured intensely enough that a view of it might be better left undisturbed. If I were to choose one, which should it be? Turned and blackened Shaker knob? Stainless steel arch? Stainless oblong? Stainless round knob? Hand crafted angular pull? Or none? Size matters. The lid is approximately 5 in. x 7 in. —just larger than is comfortable to grasp in one hand. Make, fix, create and stand up for hands on learning for yourself and all children. Yesterday I began wood shop classes for the 2017-18 school year at Clear Spring School. My high school students did framing square math in the morning using Joe Youcha's book as our guide and then proceeded to turn pens on the lathe. One of my high school students had been in my wood shop as a first grade student and I asked if he remembered carving his first writing pen. He said he still has it. He is one of my students who writes regularly in cursive. Most of the others do not. My 4th, 5th and 6th grade students also began whittling pens, (with some being reassigned as Harry Potter wands) and I plan this as an activity throughout the Clear Spring School. I asked my students if there might be some reason to learn to write in cursive. One said, "it's beautiful." Another said, "So we can read what others have written." Smart kids. Today I'll clean shop in preparation for an editor from Fine Woodworking to arrive for a photo shoot on Monday. Make, fix, create, and increase the likelihood that others love learning likewise. A radio talk show, 1A with Joshua Johnson and expert guests asked the question yesterday whether the smart phone has destroyed a generation. http://the1a.org/shows/2017-08-31/has-the-smartphone-destroyed-a-generation Guests noted a rise in psychological problems associated with smart phones and a general unpreparedness for adult life. They described a looming mental health crisis. The value of digital technology is unquestioned by most parents and educators, but is strongly questioned by developmental psychologists whose research has noted a dramatic rise in anxiety and depression directly correlated to excessive engagement in "smart" technology. While young parents may choose to use their smart phones as toys to interest their toddlers and keep them distracted, the health of their children demands that they make other choices. Many would be truly alarmed if they were made aware of what they are doing to their kids. A direct means to counter digital technology in which the smarts are in the machine and not in the student, is to engage the student in making useful and beautiful things. By crafting lovely work, the intelligence is firmly anchored in the relationship between head and hands. We desperately need all the smart, psychologically resilient kids we can get. Besides writing with cursive becoming a lost art, reading cursive has been lost as well. A modern student looking at the Declaration of Independence would find it indecipherable. Yesterday I met with our ESSA director and members of two woodturning groups about building our ESSA woodturning program. My experiment with Sam Maloof's formula continues. One more coat of finish will build up to a deeper effect. You can buy Maloof's finish all ready mixed in the can. Or you can mix your own from simple ingredients at much lower cost.